Twenty years ago, images of staggering cattle and descriptions of brains resembling Swiss cheese became associated with one of the most popular television programs of the day when Texas Panhandle cattlemen sued “The Oprah Winfrey Show” for defamation under Texas’ “veggie libel law.” They claimed the program’s negative portrayal of their business caused a steep decline of beef prices. On the surface, this conflict looked like a battle between an industry and the TV producers who portrayed it negatively. But at its heart was some complicated science that had the potential to scare the public and be sensationalized by the media. Today’s practitioners of science communication grapple with the difficulty of transmitting science information via the media to a lay audience. This 1998 trial serves as a rare public case study documenting the media’s imperfect attempts to clarify the science of mad cow disease in the midst of a celebrity spectacle. Ultimately Oprah won the legal case. But how did the public’s understanding of the science fare? A year and a half earlier, rancher-turned-animal-rights activist Howard Lyman appeared on Winfrey’s program. He claimed the American beef industry was giving cattle feed that contained remains of processed cattle. This practice, no longer legal in the U.S., had been banned by the British government in 1996 due to the belief it had led to the 1980s outbreak in Great Britain of bovine spongiform encephalopathy. BSE is a fatal nervous system disease in cattle; a human form of the disease, Creutzfeldt-Jakob, was subsequently diagnosed in England, causing the deaths of 178 people in the U.K. through 2017. Medical researchers believed this form of CJD was caused by eating the meat of cattle infected with BSE. Upon hearing these revelations Winfrey proclaimed on-air, “It has just stopped me cold from eating another burger!” The “Oprah effect” kicked into gear and the term “mad cow disease” rose in the public consciousness. The resulting lawsuit initially focused on the science of BSE and the extent of the danger to beef consumers. However, the judge’s ruling ultimately hinged on legal questions of freedom of speech, rather than whether “The Oprah Winfrey Show” broadcast scientifically valid findings. Was American beef dangerous for consumers? The verdict itself doesn’t provide a clear reflection of how effectively the science of BSE had been communicated during the trial to the jury. But the case was also tried, as they say, in the court of public opinion. U.S. District Judge Mary Lou Robinson imposed a gag order on the attorneys, prohibiting them from talking about the case outside of court. She did, however, provide permanent seats in the Amarillo courtroom for local media. One of us (Larry Lemmons) was the lead reporter for the local CBS affiliate during the trial. Celebrity sightings around the courthouse were common. PETA protesters traded insults with local restaurant employees grilling burgers for the crowd. Presumably because I was one of the primary local media reporters, my reports were followed by attorneys from both sides. When I personally met Oprah Winfrey she remarked, “So you’re Larry Lemmons.” I never figured out precisely what that meant. My media colleagues and I struggled to understand and communicate the specifics of BSE. We listened to the attorneys present the science to the jury, and then communicated those details to the public, who tended to be more interested in the spectacle. In Amarillo in 1998, although access to the internet was growing more common, we reporters tended to regard it with suspicion. We gathered news the old-fashioned way, via in-person or phone interviews. For BSE research, I went to the library and a local college where a science professor provided me with some background. Part of my job as a reporter was to get the complicated scientific facts straight, and I couldn’t ask any of the trial participants for clarification. Looking back over two decades, I wondered if my challenges communicating the science were shared by colleagues and other important players in the trial. Now, as a doctoral student of media and communication (working with Dr. Landrum and others at Texas Tech), I contacted some of them to discuss how attorneys related the science of BSE to the jury and how the media subsequently reported on information presented in the courtroom. As expected, there are conflicting perspectives on how effectively the science was communicated. 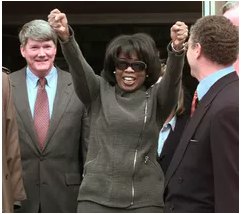 Oprah celebrates the ruling in her favor on Feb. 26. 1998. Despite representing the losing side, one of the plaintiff’s attorneys Vince Nowak said the trial was a success for the cattle industry because it convinced the public that BSE was not a serious threat to American livestock. Though he presented extensively on the science during the trial, he acknowledged that “science played a very small factor” in the subsequent ruling by the judge. Ultimately the media covering this trial were left to muddle through as best we could – and the public relied on our efforts. The case hinged on controversial feeding practices. However, recent research on how to most effectively communicate science has found that sometimes putting a scientific issue into less accurate layman’s terms can add to confusion and heighten controversy. Ledbetter’s point of view is supported by science communication research. In one study, researchers investigating a subsequent mad cow outbreak in France determined that the framing of the issue influences public perception. When people were confronted with the term “mad cow,” they reacted more emotionally than they did to a scientific label, such as BSE. It’s an open question, though, how opinion would have changed with the use of a more deliberative description of the disease during the Oprah Winfrey lawsuit. Today the CDC considers the risks to Americans from BSE to be “extremely low.” Since 1993 there have been a total of only 25 cases of BSE in North American cattle, the majority of those in Canada. In “A Comparative Study of Communication About Food Safety Before, During, and After the ‘Mad Cow’ Crisis,” food law scholar Matteo Ferrari concluded the public decides whom to trust regarding the message by how government, industry or advocates frame it. In this case, the jury determined the media’s First Amendment protections outweighed the defamation concerns presented by the plaintiffs. Ironically, because of the media focus on the trial, the perspectives of the cattle industry were also highlighted. The public got the message that there was little evidence that BSE threatened American livestock in a substantial way. Two decades of hindsight suggest that lawyers and media – in perhaps a piecemeal, stumbling way – did transmit relatively accurate science information. The cattlemen may have lost the case, but U.S. media consumers were left with the understanding that U.S. beef was safe. Media professionals still struggle with knowing how to best explain and condense complex science and public health issues in ways that won’t inappropriately trigger defensiveness, denial or fear. Research in the area of the science of science communication has made great strides in exploring these issues, but there is still much work to be done.